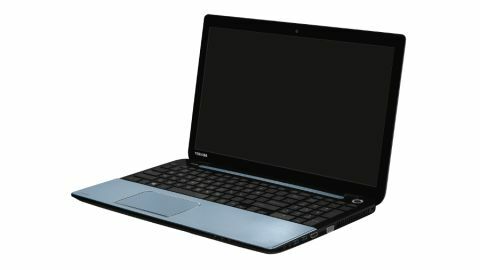 Toshiba seems to be going for the scattergun approach by launching five series of Satellite laptops to meet a variety of needs. It's billing its S series as slimmer devices that offer a choice of Intel's fourth generation Haswell CPU or a quad core AMD processor. The S50 measures 24mm thick and features a 15.6-inch TN panel. At first look this produced weak viewing angles, and its 1366x768 pixel resolution panel lacked the spark and clarity of a full-HD display. The screen itself didn't wobble when opened, which was easily possible with one hand, and we detected no flex from the unit's hefty base. The S50 features an attractive brushed aluminum design on the bottom half, which houses a roomy buttonless trackpad that provides multi-touch control. You can also opt for a touchscreen if you wish, providing an alternative method of navigating the shipped Windows 8 OS. The keyboard itself provides adequate spacing between the keys and should serve well for typing out lengthy documents. In terms of graphical choices, the S50 offers the option of shared Intel HD 4000 graphics, or dedicated NVIDIA graphics with up to 2GB VRAM. Storage wise, it's available with an option of a 1TB HDD or a hybrid configuration that combines a 1TB HDD with an 8GB SSD to speed up boot times. Our demo unit was nippy and responsive when navigating around the OS, with apps taking no more than a second or two to appear. Connectivity options are present in the form of a single USB 2.0 port, two USB 3.0 ports, HDMI-out and optional Bluetooth 4.0. The Satellite S50 is available at a cost of £299 for the base configuration.